The DCI Salutes America Premier Event in Arlington, Va., June 26, served as the highlight of the Marching Music Academy, a two-day series of workshops for teachers hosted as part of MENC: The National Association for Music Education's Music Education Week in Washington D.C. 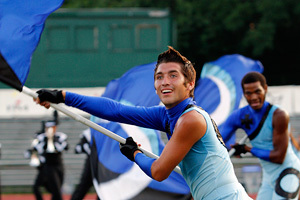 Featuring the performances of six World Class corps including the Jersey Surf, Spirit, Crossmen, Boston Crusaders, Phantom Regiment and the Bluecoats, special guests at the event included members of MENC's National Executive Board and past and current delegates of the Mrs. America Pageant who work to raise awareness about the importance of music education in schools. View this photo gallery. Read more about this event.